There’s so much more to good dentistry than just treating cavities and whitening smiles. Maintaining a strong, beautiful smile is an important job that lasts your whole life, and family dentist Dr. Dan Young and the rest of our Joplin staff want to support you every step of the way. With comprehensive dental checkups, refreshing teeth cleanings, and other quality preventive dentistry services, our goal is to help you enjoy the high level of oral health you deserve. Contact Young Family & Cosmetic Dentistry today to schedule your first appointment! The most effective way for patients to protect themselves from common oral health problems in the long term is to attend regular dental checkups and cleanings with a trusted dental team like ours. 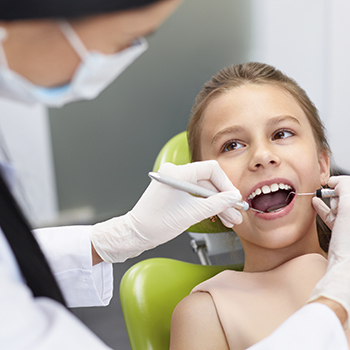 During these visits, Dr. Young will carefully inspect every aspect of your smile, from the teeth and gums to the jaw, bite, and existing restorative work (such as fillings and crowns). Digital X-rays will help reveal any concerns that aren’t immediately visible on the surface. Our goal is to create the most comprehensive picture of your oral health possible – only then can we recommend effective treatment options that are ideally personalized for your unique needs. Cleanings are also necessary in order to fight back against gradual plaque and tartar. These bacteria-filled agents are constantly spreading in the smile, and if they’re missed too often when brushing and flossing, patients may find that they’re unable to clear them away on their own. That’s where our talented Joplin hygienists come in! They’ll get rid of dangerous bacteria, debris between teeth, light staining, and more to leave your smile fully refreshed. Do you regularly suffer from pain in the jaw joints and face or severe headaches? Are your teeth strangely worn-down with no known cause? These are common symptoms of bruxism (teeth grinding) or the even more serious TMJ disorder, which occurs when the temporomandibular joints are damaged or aggravated. These conditions can be virtually debilitating, and Dr. Young wants to help you regain the quality of life you deserve. Occlusal/restorative adjustments to bring back harmony to an otherwise uneven bite. Occlusal splint therapy to help reset the jaw’s natural positioning and provide much-needed relief. MLS laser therapy to relieve chronic pain. On average, one person dies from oral cancer every hour. Here in Joplin, we do our part to decrease this number by providing routine oral cancer screenings with VELscope technology. This system uses fluorescence to reveal lesions and other tell-tale signs of cancerous cells within the mouth that may not yet be visible to the naked eye, coloring them noticeably darker than surrounding healthy tissue. The sooner oral cancer is discovered, the more likely it is that the affected patient will have a full, successful recovery. Root scaling and planing: An in-depth cleaning that targets tricky, dangerous bacteria beneath the gum line and along the root surfaces of teeth. Soft tissue laser therapy: With this revolutionary technology, Dr. Young precisely removes diseased tissue and targets pockets of infection in a comfortable and highly accurate fashion. Antibiotic therapy with ARESTIN: Often used in conjunction with root scaling and planing and soft tissue laser therapy, this direct gel helps to effectively eliminate any bacteria that were left behind.